DRAPER – Snow Canyon fought hard Friday night, coming back twice from intimidating deficits to within striking distance against undefeated Juan Diego, before the Soaring Eagle iced the game in the fourth quarter and advanced in the 3A state playoffs with a 42-28 win over the Warriors. It seemed as if the Warriors were finally having a bit of luck and that momentum was finally swinging their way near the end of the third quarter. A forced fumble by DE Brock Staheli set up a 14-yard TD pass from Warner Rigby to Zach Kennedy to bring the Warriors within striking distance, 28-20. 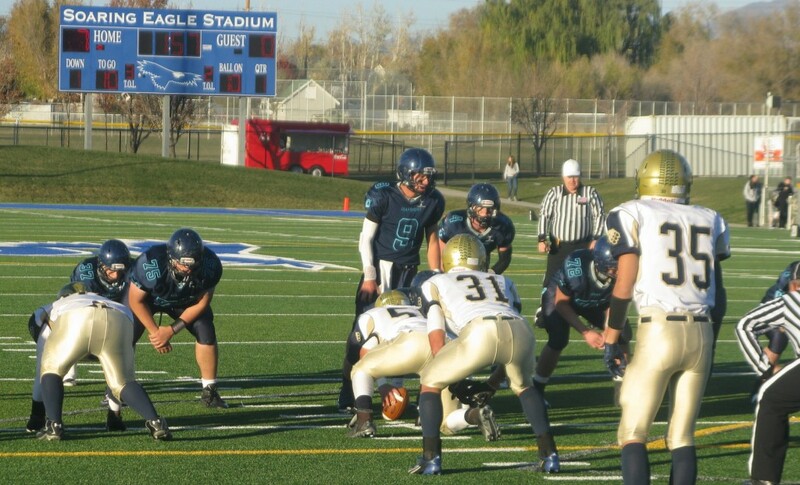 The Juan Diego offense had stalled on both of their earlier drives in the third quarter. SC was clicking on offense and the Soaring Eagles’ defense looked like they were playing on their heels. The Warriors were excited and Juan Diego looked nervous. Then Juan Diego senior QB Cole Nelson, who had two touchdowns Friday night, took advantage of great field position from a big kickoff return by the JD special teams and led the Soaring Eagle on a game-deciding drive. Senior linebacker Dominic Colosimo then extinguished any last-minute heroics from the Warriors, intercepting a tipped pass on the Warriors next drive. The interception set up another Nelson TD which effectively and unequivocally knocked the Warriors out of the 3A state playoffs. The Warriors agreed that big plays in the fourth quarter changed the landscape of the game and that in the end, SC committed too many errors. In the first half, Warriors miscues helped Juan Diego jump to a 14-0 lead. Snow Canyon, however, rallied and on the ensuing drive went 80 yards for a touchdown. Rigby capped the drive with a pass to Cole Mooring, who dove and stretched for the pylon on third-and-seven to put the Warriors on the scoreboard, 14-7. After an exchange of punts, Snow Canyon forced a fumble in JDHS territory that SC’s Trevor Horlacher recovered. This set the Warriors up with a short field and a chance to tie the game. The Warriors executed a bit of trickery, calling a double pass. Running back Conner Parry received the pitch from QB Rigby and went on a toss play to the right side, he then passed it back to Rigby on left side who reeled it in and found Kennedy wide-wide open in the end zone for a 37-yard touchdown to make it 14-13 after the PAT attempt was blocked. The Warriors celebration didn’t last long because on the ensuing kickoff, Soaring Eagle Cameron Hansen found a seam and went 78 yards to paydirt with two minutes left in the half to put JD up by eight at 21-13. Immediately following the TD return, the Warriors tried passing downfield in the waning moments of the first half, but Hansen once again made the Warriors pay as he intercepted Rigby’s pass at the SC 37 and returned it all the way to the 7-yard line, setting up teammate Chase Williams with a 2-yard TD that extended Juan Diego’s lead to 28-13 before halftime. The Warriors out-gained JDHS 347 to 238 in total yardage and had more first downs (19-13), but could not contain Juan Diego’s rushing attack as the Soaring Eagle punched it in four times on the ground. Despite a tough loss to Juan Diego, the Warriors can consider this season a big success as first year coach Matua led the Warriors to their first playoff appearance since 2006. Senior Kennedy agreed with Matua’s synopsis on the season. Juan Diego improved to 11-0 and will play Pine View in the 3A state semifinals at Rice Eccles Stadium next week. The Snow Canyon Warriors finish their 2013 campaign with a 7-4 record.